From left: TJC alumnus Patrick Smallwood and Dr. Juan E. Mejia, TJC president for branch locations and district provost. Patrick Smallwood, TJC alumnus and former executive president of the College’s Student Senate, recently presented Dr. Juan E. Mejia, TJC president for branch locations and district provost, with a special recognition that included a flag which had been flown over the U.S. Capitol and signed by Congressman Louie Gohmert, U.S. representative from Texas Congressional District 1 since 2005. In addition to his leadership role on the TJC Student Senate, Smallwood served as an Apache Chief. He graduated from TJC in May 2018 and transferred to Texas Tech University. 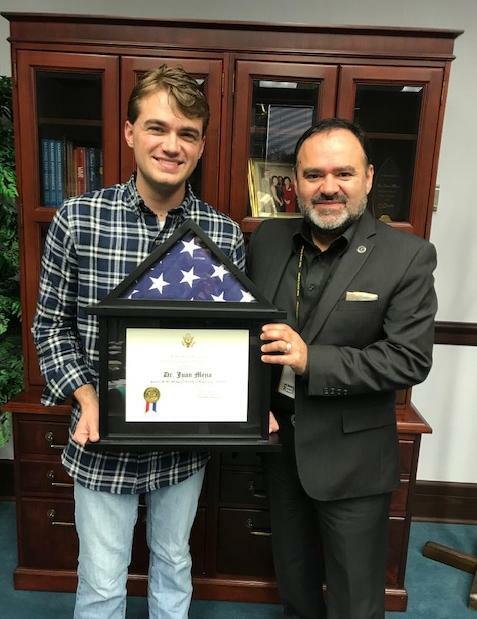 During his time at TJC, Smallwood, a Tyler native, distinguished himself by completing internships with both Congressman Gohmert and with Senator John Cornyn, senior U.S. senator from Texas since 2002.